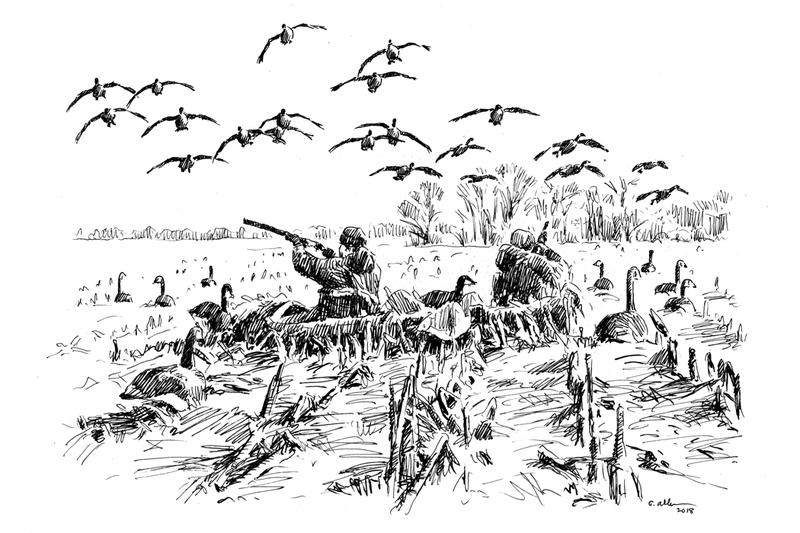 Sandwiched between Chip and another friend, I lay prone in my one-man blind and waited for Chip—an expert caller—to coax the geese into range. A cacophony of excited honking insisted they were coming . . . and fast. My heart jumped and my neck skin crawled, involuntary responses that still occur after a lifetime of gunning geese. “Showtime!” Chip commanded. Guns blazing, the three of us came to life like grave-bursting zombies, and the dull morning sky fell apart with broken birds. Only two geese flew off while Chip’s Labrador retriever, a young male named Judd, tore through the shorn corn looking for the fallen. Goose hunters live for such moments, which happen far more often now than they did when I began waterfowling as a kid 60 years ago. Back then, rare, indeed, was the day that anyone shot a Canada goose while hunting ducks on Saginaw Bay, Lake St. Clair, the Shiawassee River flats or Lake Erie’s Pointe Mouillee—popular Michigan hotspots then and now. I remember a Sunday morning in the Saginaw Bay marsh when my father bagged the biggest goose I had ever seen: a monster Canada that memory says plunged a scale to more than 12 pounds. In 1970 the DNR estimated Michigan’s Canada goose population at only 9,000 birds. Some biologists argued that the strain of giant Canada geese (Branta canadensis maxima), like the one Dad had shot, was extinct. Today the state is home to 300,000 geese, many of which are giant Canadas. Because four of every five live in southern Michigan, numbers have grown to nuisance proportions, prompting liberal hunting opportunities that begin September 1 and run into February. Populations have exploded elsewhere, too, especially in the eastern US where urban and suburban dwellers unwittingly provide ideal habitat by way of lush lawns, golf courses, city parks and public beaches. Thanks to mild winters and farm fields of winter wheat and leftover grain, many Canadas stay home instead of migrating. 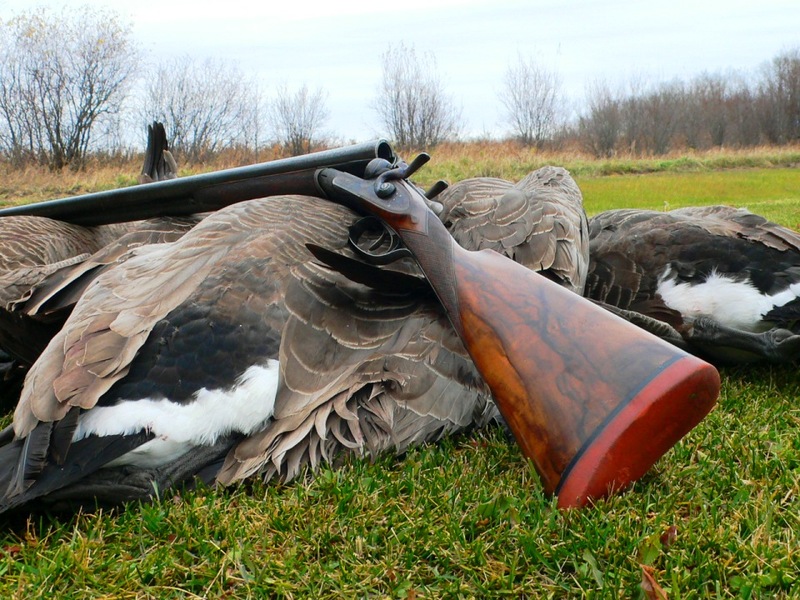 Municipal hunting bans translate to sanctuaries, and the geese know it. So urbanites have devised all kinds of ways to keep geese off lawns and away from waterfronts. Chemical treatments, fences, noisemakers and dogs trained to chase come to mind. Hunting is a better way to control the birds, and opportunities abound. In addition to extended seasons in many states, bag limits tend to be generous. In Michigan, for example, hunters are typically allowed five geese daily and 15 in possession, depending on when and where you hunt. Goose breast tastes delicious, by the way. Prepared like beefsteak, the lean, protein-rich breast of a young bird reminds me of filet mignon. If you’re a carnivore, like I am, that can make for goose bumps too. I have a goose breast recipe that wife will only eat that way. It is not like beefsteak.